Cut chicken into bite size chunks, and place in a sealable container. Mix cooking oil, cilantro, sage, onion powder, salt, black pepper and cumin. Allow to marinade in sealed container 30 minutes to 24 hours. Add rice and cream of celery soup to a 12 inch Dutch oven. Pour in two cans of chicken stock and mix thoroughly. 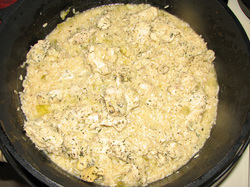 Add chicken to Dutch oven. Use 8 coals on bottom and 16 coals on top, cook for 1 hour 30 minutes to 1 hour and 45 minutes. Rotate every 15 minutes and replace the coals after 45 minutes. If needed remove lid after 1 hour and 30 minutes to reduce the broth.